It’s increasingly common to find altimeters stuck inside of other types of equipment. When you’re looking for accuracy, you typically want an instrument made specifically for the tasks you have in mind. On the other hand, some people want their altimeters do be able to more than simply read altitude. Like with so many measuring instruments, the quality of an altimeter heavily depends on cost. If you don’t need extremely accurate results, then you’ll be able to pick a cheap-and-simple altimeter. Someone who’s using the altimeter for casual interests, rather than scientific research or exploration, would be better off with a simpler machine. Accuracy is generally within a couple of percent, especially if you’re selecting among some of the better altimeters on the market. But you can get pin-point accuracy if you’re willing to pay for it. A general altimeter will be able to measure about 15,000 feet. If you’re looking to measure greater heights, then you’re going to need a much stronger altimeter. The pressure-based measurement tools employed by basic altimeters are often ineffective choices for users who need higher precision. Construction quality is important for almost every type of measuring instrument, but it’s particularly important if you plan on picking up a handheld altimeter. The handheld nature of these devices means they’re particularly vulnerable to suffering drops, enduring rain and snow, or otherwise being embattled by nature. Unless you only plan on using the altimeter while indoors, you’ll want to ensure it’s built to survive through rugged use. Portable means different things to different people. If you’re counting every ounce of weight in your bag because you’re climbing up the side of a mountain, then even minor differences in size can count for something. Size also relates to the general portability and storage capabilities of an altimeter. Would you like your instrument to be able to dangle on a keychain or zipper? What about an altimeter built to be worn like a watch? Depending on how you intend to use the instrument, you’ll find there are plenty of different options available for your consideration. The Sun Company Altimeter 203 is the dictionary definition of a basic altimeter. Built to provide information about barometric pressure, the 203 is a pretty standard analog device. It’s got a simple yet highly readable interface, and single-dial operation which allows you to evaluate a wide range of low-pressure and high-pressure systems. But just because it’s basic doesn’t necessarily mean the 203 is boring, or that it has nothing special to offer. In fact, it has some of the most impressive accuracy you’ll find on any altimeter that doesn’t require a battery to operate. From a physical standpoint, the 203 is primarily composed of ABS plastic. Though most people think of plastic as being cheap garbage, it’s also the perfect material to construct certain types of devices. Because ABS plastic is cost effective, impact resistant, and holds up well against both heat and cold. It’s also lightweight, even compared to something like aluminum. The Sun Company Altimeter 203 measures roughly 2.3 x 1 x 1.5-inches, and weighs about one pound. Unfortunately, it feels a little weighty in your hands. Attached to the bottom side of the device is a rope lanyard. The rope is also composed of pretty tough and thick material, reflecting the general ruggedness of the rest of the device. Likewise, the rope is gray, matching the gray chassis of the altimeter. The weighty feeling of the 203 goes away once you’ve managed to make use of the lanyard, but it does mean the 203 is a little subpar for certain types of excursions. If you were looking to enter truly rugged circumstances, you’d also want to keep in mind that the 203 is only partially shock-proof. It would survive some pretty serious falls, but you wouldn’t want to intentionally put that to the test because it would almost certainly cause superficial scarring to the device. With respect to its measurement capabilities, the Sun Company Altimeter 203 can read elevations between sea level and 15,000 feet. That range is reflective of the means by which this device measures barometric pressure, which is through mercury. It’s actually quite similar to a thermometer in that regard. But like a mercury thermometer, you’ll find these devices perform differently at extremely high elevations, which is why they’re less suitable for altitudes above 15,000 feet. With respect to accuracy, you’ll find the 203 will provide readings that are accurate within roughly 50ft. The only difficult part of getting an accurate reading is actually staring at the needle carefully, and determining precisely where it’s pointing. Because the 203’s interface is somewhat crowded, and there’s no digital readout. But provided you take the time to carefully observe where the needle is pointed, you’ll find this is an incredible accurate altimeter, relative to its cost. 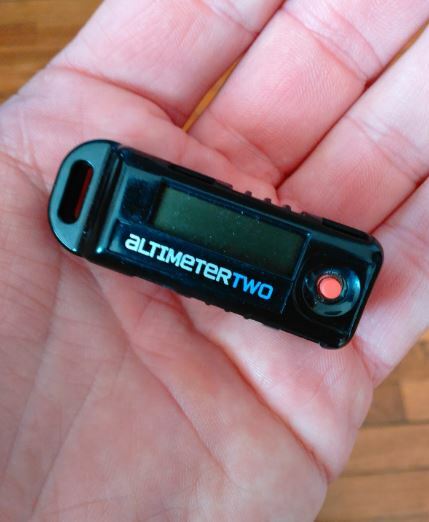 The Sun Company Altimeter 203 is easy to take readings from, though you really need it to be within reaching distance to actually get a good view of the data. The 203 also includes some handy step-by-step use instructions, for people who are interested in maximizing the lifespan of their equipment. Devices like the 203 are really barometers, not really altimeters. Because they’re barometers, you can calibrate them in reference to your current altitude, to make them even more accurate. But the 203 has a problem with its adjustment dial. It tends to get bumped while the unit is in your pocket. Without the addition of tape to hold the dial in place, you end up having to recalibrate pretty often. 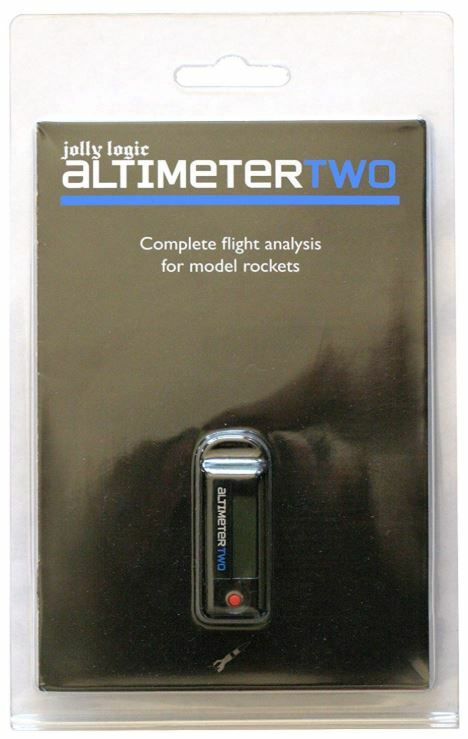 The Jolly Logic AltimeterTwo wasn’t made for mountain climbing, it was made for model rockets. This Altimeter actually uses technology far more sophisticated than a mere barometric pressure reader. It actually uses pressure and acceleration sensors that are nearly state of the art. With the unique load of sensors onboard this device, it was clearly intended specifically to be used for flight analysis of model rockets. Consequently, the AltimeterTwo lets you collect data from your rocket sims, including your ejection altitude, apogee, flight time, average acceleration, peak acceleration, and so forth. It’s like having a command center or a black box inside of your rocket. The Jolly Logic AltimeterTwo is about the size of two quarters that are sitting side to side. Measuring 0.6 x 0.7 x 0.2-inches, you can stick in on a zipper or in a pocket without second thought. It also weighs about a quarter of an ounce, so you’ll find it isn’t burdensome to place inside of a small model rocket. You don’t need batteries because the Jolly Logic AltimeterTwo makes use of USB-based charging. Not requiring external batteries means this altimeter won’t suddenly double in weight once you’ve got it powered up, unlike some devices. 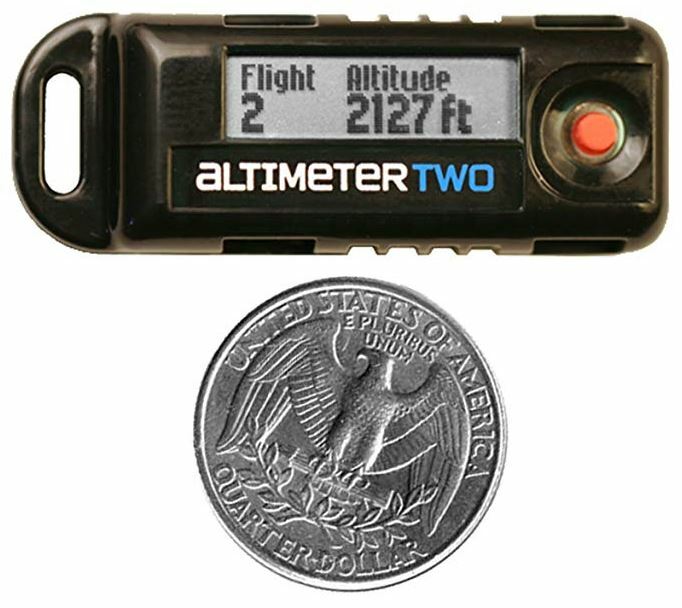 The AltimeterTwo offers a peak altitude measurement of 29,500 feet. 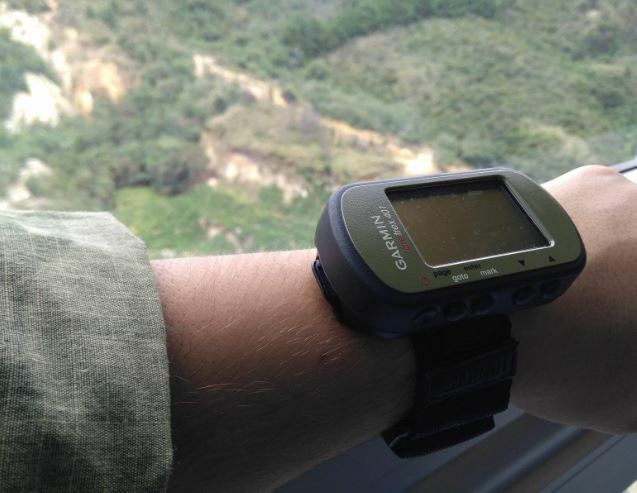 That’s about 9,000 meters, and it’s also about double the reading capabilities of the Sun Company Altimeter 203. Additionally, this altimeter is capable of recording elements like kilometers per hour. Though those kind of readings wouldn’t be very useful in a non-rocket scenario, it’s nice to know the altimeter inside this device compares favorably with legitimate mountaineering equipment. The Jolly Logic AltimeterTwo can be recharged with through any USB port. But your data cannot be downloaded. In order to access key statistics, you’re going to have to read them off the onboard LCD screen. Because the device is about the size of a couple of quarters, the screen feels like you’re trying to read text on the side of a quarter. But it only takes a couple of seconds to flip through the data, so you don’t have to spend much time straining your eyes. Sometimes, basic isn’t enough. The Garmin Foretrex 401 Waterproof Hiking GPS isn’t merely an altimeter, but also a full-fledged GPS receiver. Because it’s intended to be worn as a watch, Garmin went further by including a sunset and sunrise timer, a trip computer, an electronic compass, hunting and fishing data, as well as a potent barometric altimeter. Additionally, the Foretrex 401 supports a dual position readout, allowing you to view your present location in a variety of different formats. Thanks to audible tones that alert you to GPS information, using the 401 is quite intuitive. Because this device is made by Garmin, it’s further supported by some impressive GPS technologies, like their TracBack feature. That allows you to retrace your path along the LCD display. The Foretrex 401 is about the size of a watch. Its forest-green body measures 1.7 x 0.9 x 2.9-inches, ignoring the Velcro strap intended to help secure the 401 to your wrist. The majority of the device is covered with its display. The display is actually measures about 1.4 x 0.9-inches, but the screen resolution is unremarkable. It’s basically a three-line readout, with the screen divided in half, and the topside sharing two lines of text. It’s also a 100×64 pixel display. That’s good enough for the kind of basic text readout that you’ll need to get from a handheld altimeter, but it does pale in comparison to the kind of screens that people have become accustomed to using. However, the screen does have backlighting, and it turns off automatically after about thirty seconds. Those are important redeeming factors, especially if the only thing you’re interested in is clarity. Battery-oriented design decisions like that are also what allow the 401 Waterproof Hiking GPS to provide an excellent battery capacity. You can expect roughly 17-hours of functionality while you’re making steady use of the GPS features. That number greatly multiplies for every moment that you’re not actually using the altimeter. The GPS portion of this device is surprisingly good for entering areas where there is dense tree cover, or entering terribly deep canyons. Though you’re ultimately at the mercy of your GPS provider when it comes to coverage, the Foretrex 401 does its part in finding a signal marvelously. You could hardly expect better performance, at least not without using a giant antenna. There’s a clear utilitarian feeling to this device. That feeling is probably accentuated because this device displays military grid reference system coordinates. And its accuracy reflects about the best you can expect from a global GPS provider like Garmin. But there are still some common sense limitations in play. For example, when you hold the compass level during navigation, you’ll get greater positional accuracy. 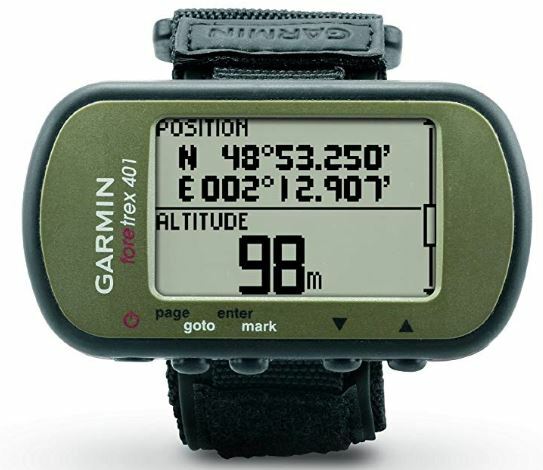 In addition to the Velcro strap, the 401 Waterproof Hiking GPS includes a USB cable and a user manual. It requires a pair of AAA batteries for operation, which are not included. Garmin provides a couple of months of warranty coverage, and their support staff are easily the best among any altimeter on this list. Though that’s mostly because Garmin is a much larger company. 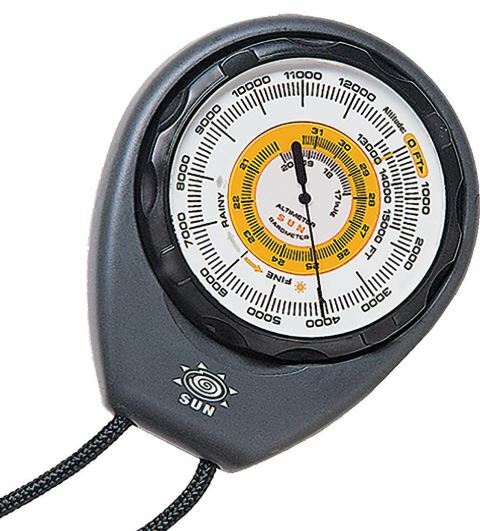 The Sun Company Altimeter 203 is a great handheld altimeter. It’s intended for exploration, mountaineering, and similar outdoor activities. You probably wouldn’t want to use an altimeter like this for scientific work because you’ve got to eyeball your data readings, and that leaves you dependent on your best guess. But the battery-free nature of the Sun Company 203 works as a counterbalance to that issue. The Jolly Logic AltimeterTwo wasn’t made for mountaineering, it was made for rockets. For getting workable data from your rocket launches, that you can actually use in concrete ways, the AltimeterTwo is an excellent device. It’s lightweight, self-sustained, and relatively inexpensive. The only thing that could greatly improve this altimeter would be the ability to export data. Finally, there’s the Garmin Foretrex 401 Waterproof Hiking GPS. Like its name suggests, it’s much more than an altimeter. The Foretrex 401 can give you GPS coordinates, sunrise timers, and half a dozen other features that help make this device uniquely suited for hiking. If you don’t need those kind of extra features, then you’d be better off with a barebones altimeter like the Sun Company 203. But if you’re looking for something that can do more than measure elevation, the Foretrex 401 is a force of nature.